WOW! How does Sonisphere keep doing this? The bookers of this festival are literally changing the way festivals get booked. 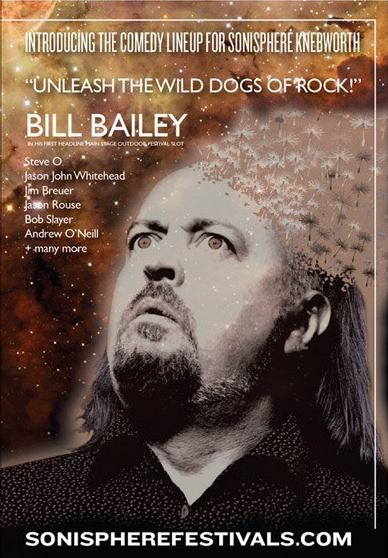 Bill Bailey headlining the 2nd stage of Sonisphere before Slipknot headline the main stage is amazing. 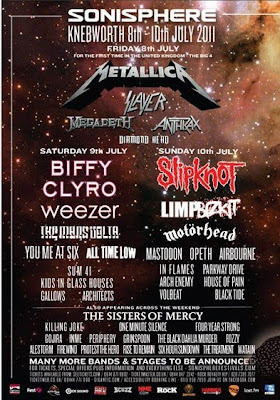 I had assumed based on logo positions that Motorhead would headline the second stage before Slipknot but this is so much better. It also means I shouldn’t have to miss any Motorhead to see Slipknot. I won’t miss any Bill Bailey either, but I’ll just stand near the back. I’ve seen him twice at Leicester Square Theatre so I don’t need to be up and close. However if he books more LST dates to warm up for Sonisphere, I’m all over them. He is that good live. As for the other comedians, I don’t think I’ll bother with Steve-O. I saw one of his videos back in the day and he was just hurting himself and laughing. It really wasn’t that funny (and I’m not against Jackass – some of that was funny but this video was not). Andrew O’Neil was good last time so I’d go see him again if the time worked out. I’ve heard of Jim Breuer but I can’t think why. The others I don’t know but I’ll be doing some research about them as time goes on. Congratulations Sonisphere on another solid booking. In other news, I have got a job interview next week. I hope it goes well cause I could really do with a new job. I do want to get a new job. It would work out quite nicely with my work schedule actually if I got a new job now. I have two days left at work and then I go on leave for 2 weeks. April is a good month to be term time as it means I’m only working 7 days in the whole of April (8 if you include Friday, which I don’t as it is before my leave). I’m looking forward to doing nothing for two weeks.